The illustration on this sheet music cover is beautifully executed; houses and even a cathedral can be seen in detail on the hillside. 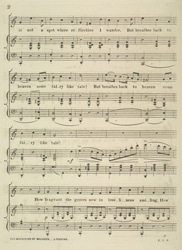 In many of the sheet music covers in this collection, the illustration is dominant and the lettering is secondary, (although still vital as it gives information about the lyricist, composer, and especially the performer and the publisher). By the second half of the 19th Century new letterforms became popular and the image began to lose its importance, instead ornate fonts were used alongside photographs of the performers . Lithographic illustrations like this one looked very old fashioned by this time, even if there were so much more intricate.